Many people in the health community or those seeking a healthier diet with an abundance of nutritional element are turning to brewers' yeast as a daily addition. Because it is also low in fat, sodium, calories, and carbohydrates, it is also beneficial for those with diabetes and hypoglycemics. Brewers' yeast is a natural source of Vitamin B complex and highly concentrated amounts of protein, as well as a wonderful spectrum of other healthy vitamins and minerals. Brewers' yeast is usually recovered as a by-product of the brewing process, absorbing the chemicals, vitamins and nutrients from the other ingredients utilized in brewing beer, mainly grain, malt and hops. The resulting product, though quite healthy, is usually quite bitter. Many brands of brewers' yeast are labeled as debittered, but this process, which makes the yeast more flavorful, can also serve to remove some of the nutritional content. A high nucleic acid count, a valuable commodity in regards to cell development, is present in brewers' yeast, as well as ample amounts of folic acid, potassium, thiamin, niacin, chromium (needed for the body to produce insulin), and much more. The simplest way to add brewers' yeast to your daily diet is to add a tablespoon to fruit juice and drink it, but it can also be added to meals such as meat loaf, salads, casseroles, cereal, soup, and other foods. If possible, add the yeast at the end of the cooking process, or the vitamin B complex will be destroyed. Consumption of brewers' yeast is also attributed to several health benefits, such as reduced stress, better metabolism and lower cholesterol. It can also help provide restful slumber and ease fatigue. yeast, and will most likely be absent of chromium. Brewers yeast (Saccharomyces cerevisiae) is a natural ingredient produced from the spent yeast grown during the production of beer. The spent yeast is washed, recovered and dried at a controlled temperature stopping biological activity whilst maintaining its unique nutritional properties. Brewers yeast contains a natural mixture of high-grade protein, vitamins and minerals and therefore is an excellent cost effective way to enhance the nutritional value of basic foodstuffs. It is one of the most concentrated natural sources of the B group vitamins, including riboflavin, (Vitamin B1) and thiamin (Vitamin B2) but not B12. Brewers yeast contains a minimum of 40% high-grade protein and therefore the amino acids essential for good health, one of them being lysine. 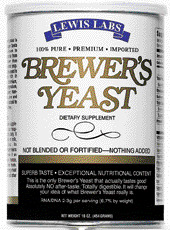 Brewers yeast also provides a natural source of minerals such as phosphorus, calcium and potassium. Brewers yeast contains approximately 36% carbohydrate and more specifically oligosaccharides, which are considered to have a prebiotic effect. It has been use to combat diarrhea and to help with cholesterol reduction. Properties of Brewer’s Yeast: Brewer’s yeast is a splendid source of B-complex vitamins, thiamine, riboflavin, protein (essential amino acids which make up about 50% of its weight) and several important minerals, in particular; calcium, iron, potassium, selenium and chromium. Brewer’s yeast may change bacterial flora in the large intestine.